It’s a shocking statistic: According to a recent NewsChannel 5 report, 60 dogs and cats are euthanized each day in Davidson County because homes cannot be found for these innocent animals. But luckily, at least one private local organization is battling this terrible tragedy. 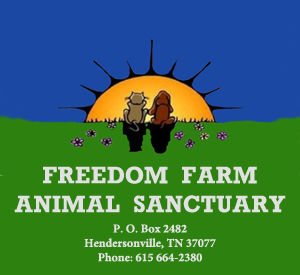 Launched more than a decade ago, Freedom Farm Animal Sanctuary is, in the words of its new president Gayle Zei, “neither a true sanctuary nor a farm.” What it is is an organization of foster homes for animals. When you work with Freedom Farm, you commit to bringing an abandoned, stray animal into your “foster home” until Freedom Farm can find a “forever home” for the animal. UNDERGROUND NASHVILLE: You recently became the new president of Freedom Farm. Why is this work so important to you? GAYLE ZEI: The work you do for a paycheck feeds your body, [but] at this time in my life, I need something that feeds my soul. I have been rescuing animals since I was seven or eight; it’s in my blood. I am blessed to have a husband of 27 years who is as dedicated to loving animals as I am. The need is so great. With the economy in trouble, often it is the animals that suffer first. You can’t go behind any strip mall or fast food place at night and not see dozens of abandoned cats. Freedom Farm has helped me focus my efforts. UNDERGROUND NASHVILLE: When a person agrees to provide foster care to a dog or cat through Freedom Farm, how long does the person commit to? GZ: That is a tricky thing to answer. It depends on so many factors: the health and age of the animal; the time of year; the economy (people don’t add to their families and often have to give up their critters when money gets tight); and, in the case of the dog fosters, how aggressively the foster “shows” the dog in their care. The more they’re seen, the better the odds of getting adopted. Cats get rotated in three-week cycles at the Petsmart in Rivergate, until they get adopted. It truly can be a few days or months. UNDERGROUND NASHVILLE: What are Freedom Farm’s primary needs right now? How can people in greater Nashville best support you and your work? GZ: SPAY and NEUTER your pets! Talk to your friends and neighbors about doing the same. Animals do NOT “need” to have “just” one litter. If your children need to see the “fun of having kittens/puppies,” take them to any shelter and enjoy those that are already here. Freedom Farm is lucky to be partners with Petsmart Charities, and many of our normal operating costs are covered. We really need PEOPLE to DO things, like various computer work . . . finding valuable items to sell at future events . . . delegating/organizing other people . . . joining our board . . . FOSTERING . . . and money always helps. More than 40 years after the feminist movement dawned in the U.S., women still grapple with many of the fundamental questions it first generated: Why is balancing work and family/personal life so difficult? Why is “having it all” so elusive? Why are women still disproportionately under-represented in our business and political leadership ranks? UNDERGROUND NASHVILLE: Let me start with a “devil’s advocate” question: Since the 1970s, many books have been written about how women can best balance their work and family (or personal) lives. Why is this book needed at this particular time? JODI ECKER DETJEN: The bad news is that this book is needed because women’s progression has stalled. Women are approximately 50 percent of the workforce but their representation in leadership has barely moved over the past decade. Women still make up only 14.3 percent of Fortune 500 CEOs, 16.6 percent of board seats, 19.5 percent of law partners, 22.8 percent of available state-level executive positions, and only 18.3 percent of Congressional seats. Further, we see in the media a plethora of judgments of what it means to be a woman today and yet, according to our research, it doesn’t mirror what women really want at all. Our interviewees told us they wanted an integrated life, with time for career, life/family, and themselves. They want integration. This book explains through [true] stories how women might achieve this, by looking at the underlying systemic, external rules and then exposing them as simply assumptions, not fact. UN: Why do women still struggle with balance more than 40 years after the dawn of the “women’s liberation” movement in the U.S.? JED: Kathy Oneto from Anthem found that women believe they must “do it all,” “look good,” and “be nice.” Using these “ideal womanhood” external rules as a basis, women then make decisions about their career or life (we call it “the Feminine Filter”). Because balance implies there is an either/or choice, they then have to choose: either they can have a career or they can have a life/family. When a woman has to follow these rules instead of doing what she wants—for example, when she can’t say no to finishing a project over the weekend because she wants to “be nice”—then she must give up something else. When she brings her own needs into the equation, then it’s not a decision about what has to be given up (i.e. the balance seesaw), it’s a negotiation for what it could look like. For example, she could say, I have plans this weekend. What is required by when? Then she can brainstorm various ways to meet the expectations. UN: What is the implication of the “orange line” you refer to in your book’s title? JED: The Orange Line™ represents a career path characterized by both a full and enjoyable career, as well as a robust, integrated life. Instead of a singular focus on work, the Orange Line™ individual turns early career traction into a launching pad for a whole life, with enriching and fun work, family, and life activities. Orange Line™ individuals take a conscious approach, learning to pace themselves early on, taking breaks and enhancing their life with activities and people outside of work. The Orange Line™ worker does not need to choose work or life; they choose both and live both fully. UN: On the dust-jacket of The Orange Line, you say your book is “the most radical call to arms for women in decades.” Why so? And what will women gain from embracing your radical call to arms? JED: It’s radical because we are exposing the underlying assumptions that hold women back and then giving them tools to reframe those assumptions, thereby eliminating the assumption’s power. For example, instead of the assumption I am primarily responsible for home and family, we reframe it to be We are all responsible for home and family. With that simple reframe, now child-care decisions are both parents’ responsibility, a woman’s career can be as important as her husband’s (or vice versa) because they are both responsible for the children. Housework can be a negotiation instead of a default. A messy house can stop being a symbol of a woman’s worth. Decisions can be made considering longer-term implications rather than to suit the current situation. It’s freeing, it’s empowering, and it enables women to make decisions without the filter of the “ideal woman’s” rules. She can make decisions about career and life based upon what she needs and wants—not as a sacrifice but as an equal party at the table. Imagine sitting in your living room . . . your favorite wine or beer in hand . . . and hearing some of the best live music you’ll ever hear anywhere. That’s pretty much the Kimbro’s experience. Small in square footage but big in heart, the Franklin, Tennessee-based Kimbro’s is easily one of the most enjoyable and comfortable live-music experiences in Middle Tennessee. The first show I ever caught there was The Burritos (now called The Burrito Brothers), the superb local band inspired by the artistic legacy of Gram Parsons. That night I became I big fan of the intimate venue, and I’ve never looked back. UNDERGROUND NASHVILLE: Why was Kimbro’s launched in Franklin rather than in Nashville? WILL JORDAN: Kimbro’s was launched in Franklin in 2005. We opened in Franklin because that’s where we live, and Franklin is a happenin’ place. I was born and raised here, and Franklin has always needed something like Kimbro’s. UN: Why do you feel Kimbro’s is a distinct live-music venue? What do people experience there that they might not experience at larger venues? WJ: Everybody feels at home at Kimbro’s. There’s a welcoming atmosphere that emanates the minute you walk through the door, whether it be a bartender introducing you to the very different vibe that is Kimbro’s, or a regular eager to host. UN: What are some of the shows you’ve been proudest of over the years? WJ: Some of the folks who have played Kimbro’s include John Prine, Ween, Cowboy Jack Clement, Ivan and Alyosha, Alex Marley, The Steeldrivers, Rodney Crowell, Pokey LaFarge, Regi Wooten, Mary Gauthier, Walter Egan, Lydia Loveless, Tristen, Ex-NFL bruiser Kyle Turley, Shannon “Law Dawg” Lawson, Roger Cook, Nanci Griffith, Ron Block, Joshua Black Wilkins, Sweethearts of the Rodeo, Kenny Vaughn, Shawn Camp, Phil Keaggy, and King Billy. Kimbro’s Café is located at 214 South Margin Street, Franklin, TN 37064. For more information (and to hear a really cool Tom Waits tune), please visit http://www.kimbroscafe.com. David M. (Dave) Carew is writer/editor of “Underground Nashville” and the author of the novels “Everything Means Nothing to Me: A Novel of Underground Nashville” and “Voice from the Gutter,” both now available at XLibris.com and Amazon.com. Dave is also a freelance book editor, publicist, seminar and workshop leader, journalist, and advertising / marketing / public relations writer. The 6th annual Gram Parsons tribute concert (Gram InterNational Nashville VI) has announced its artists line-up for this year’s two-day event. To be held on Friday and Saturday, November 8 and 9, at Douglas Corner, this year’s event will commemorate Gram and his music 40 years after his death, and the passage of 40 years since Gram’s debut solo album GP. Performers of particular note will include Jock Bartley, who played with Gram on the Fallen Angels tour just months before Gram’s death. Jock’s band will include Rick Shell, formerly of Pure Prairie League. Other don’t-miss artists will include The Burrito Brothers® (whose album Sound as Ever is Flying Burrito Brothers caliber), along with Bob Buchanan, who co-wrote the classic “Hickory Wind” with Gram while the two of them were in the ground-breaking International Submarine Band. David M. (Dave) Carew is writer/editor of “Underground Nashville” and the author of the novels “Everything Means Nothing to Me: A Novel of Underground Nashville” and “Voice from the Gutter,” both now available at XLibris.com. Dave is also a freelance book editor, publicist, seminar and workshop leader, journalist, and advertising / marketing / public relations writer. Editor’s Note: Over the past few weeks, Roy E. Perry—who wrote book reviews for The Tennessean and Nashville Banner for more than 30 years—has been enthusiastically reading and reviewing the novels of acclaimed Southern writer Lee Smith. In his final review of one of Ms. Smith’s works, Mr. Perry focuses on the acclaimed novel that won the W. D. Weatherford Award in 1988 for outstanding new books about the Appalachian South. Lee Smith’s seventh novel and arguably her best, Fair and Tender Ladies consists of a series of letters written by Ivy Rowe Fox to members of her family. The novel begins in Sugar Fork, a “hollow” in which Ivy’s parents eke out a living on a hardscrabble farm. Soon Ivy Rowe, 17, has a “love child,” the first of her many amorous adventures. A tragic firedamp explosion in the Diamond coal mine causes Ivy to muse, “Life is nothing but people leaving.” One is reminded of the litany found in the Book of Genesis: “He was born, he begat, and he died.” Fair and Tender Ladies is an extended chronicle of such inevitable losses. Ivy learns new perspectives on life the hard way—by chasing after the fool’s gold of sensuous pleasures. A young woman with a smoldering libido, she becomes involved with a “back-door man”—a man who goes out the back door while the woman’s husband comes in the front door. Looked at objectively, the entire novel is Ivy’s apologia for her licentiousness, a desperate attempt to justify her lustful ways, which, she insists, are caused by her (God-given?) nature. Regardless of how readers assess Ivy’s checkered career, one fact is plain: Lee Smith is a consummate storyteller. Her artistry both attracts us to and repels us from the protagonist. Ivy’s tortured pilgrimage exemplifies “the way of all flesh”—the tragi-comedy we call life. Lee Smith was born in Grundy, Virginia, in 1944. She is the author of 12 novels and four collections of short stories. One of the many wonderful things about “the new Nashville” is the rapid and exciting growth of mixed business/residential complexes, many lying just 15 minutes from downtown. One of them is Lenox Village in southern Davidson County, just north of the Davidson / Williamson County line. On Saturday, for the first time ever, Lenox Village will present “Fair on the Square,” a free-admission festival that will allow the hundreds of people expected to attend the opportunity to “sample the wares” of the area’s many new and diverse restaurants and other businesses. Attendees can enjoy free samples from 25 food trucks . . . free offerings from other businesses, services, and providers . . . live music from PCG Institute artists, including Autumn Nicholas, Jordyn Pepper, Cassandra Joy, Taylor Giese, Erin McLendon, and Demi Downing . . . and fun games and contests, including the chance to win free pizza for an entire year from Pie in the Sky Pizza. Fair in the Square runs from 10 a.m. to 2 p.m., and will be followed by other festival events at Lenox Village later this year. Lenox Village is located (technically) at 6900 Lenox Village Drive, 37211. Coming from Nashville on Nolensville Road (Pike), it is approximately one mile south of the Nolensville Road / Old Hickory Boulevard intersection. I recently had a candid conversation with myself. It took a lot of courage, but I pressed on nonetheless. “You, know,” I said to me, “living in a house five times bigger than you need may not be the swiftest way to travel.” I thanked myself for the tough-love talk and, a month later, sold my house. Gertrude surprised me last night (by way of Wikipedia) by revealing to me that she is not merely Gertrude. She is Gertrude and MR. Gertrude. Come to find out, the male mourning dove incubates the eggs in the morning and the female in the afternoon and night. I’m pretty sure this is why Gertrude gains several pounds every morning, then—quite remarkably—loses them everyday immediately following lunch, an otherwise counter-intuitive phenomenon. So this has been an interesting experience: I thought I’d be alone here, but instead I have two delightful companions. Now if I could only think of a better name than Mr. Gertrude . . .
You are currently browsing the Underground Nashville blog archives for June, 2013.